Transformers 2 was a nonsensical train wreck. Cast and crew promised the next would be better (possibly even scripted!). Well, the NASCAR vehicles in Jalopnik-reader Dylan's Transformers 3 set photos indicate otherwise. Maybe they'll only fight while turning left. 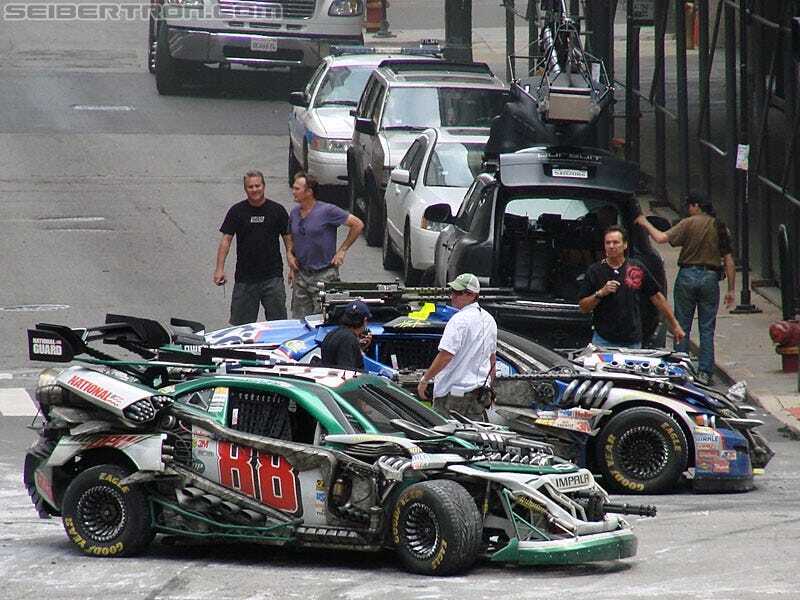 Yes, we ran set photos from Transformers 3 filming in Chicago earlier, but they didn't include the horror of NASCAR vehicles on set. As we all know, the way for alien robots to be inconspicuous in a major urban area is to hide in plain sight disguised as brightly painted race cars. We're counting at least three different cars, which means maybe they'll be a deliciously stereotyped trio of hilarious redneck robots. Hey, it worked with knock-down, drag-out, smack-you-in-the-face funny stereotypes of black people in the form of the Beat and Trax twins from TF2.